The Basilica of St. Benedict of Nursia is built according to the tradition on the ruins of the native house of the St. Benedict. The disposition of the internal spaces is made according to a Latin cross map with a polygonal apse; its interior, on two levels: on the top level we find the main church whole the crypt, where we can see parts of antique roman walls, is on the inferior level. The walls are decorated with precious frescos dating back to 1500 and prints of 1600. 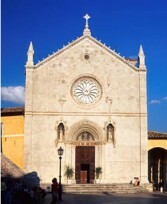 The outside of the church of St. Benedict of Nursia presents its original structure only in one part of the façade, characterized by an elaborated rose and a beautiful ogival portal. A portico gives movement to the right part of the church along all the side up to the belfry. St. Benedict of Nurcia, according to tradition, was born in Nursia around 480 after Christ. He makes studies of literature in Rome, where he lives the state of civil and moral decadence in which the antique capital of the empire has reduced itself and when he is more or less twenty years old he starts his experience as an hermit taking refuge in a cave near Subiaco, in the high valley of the “Aniene”. There, his example leads some friars to join him even if, in a second phase, the rigidity of his Rule will take them to such a big exasperation that they arrive to the point of trying to kill the Saint. The world around him is living days of profound changes; the year 476 had seen the end of the Occidental Roman Empire with the destitution of the Emperor Romolo Augustolo, the attempts of Teodorico for a stable peace between Goths and Romans end up in a bloody war (535-553) but, above all, for a spirit so sensitive to the problems of the Church, the unjust policy of the Byzantine Emperor Giustiniano in the religious area is deciding. Before he retires in Montecassino in 529, where he dies on March 21st 547, he founds some monasteries at the limit between Lazio and Abruzzo. In 1964 Pope Paolo VI proclaims him "Patron of Europe".